This episode will be 80 minutes in total, making it longest one so far. HBO hasn't given out a plot synopsis, but you can expect find one in the DVD/BR copy once upon time it comes out. Holy Blue Plasma Undead Dragon of Death! I was certain that the Hound's strangely quiet steamer trunk would contain a pile of dust at the parley big reveal. Wrong! I was uncertain that Cersei had suddenly found a dose of sanity and discovered the greater good. Right! I was convinced that Cersei would kill Tyrion. Wrong! I was unconvinced that Cersei would kill Jaime. Right! I was sure that Theon, once he had closed the gap, was going to take a stab at killing Jon. Wrong! I was unsure that Little Finger had succeeded in manipulating Sansa into turning against Arya. Oh, so satisfyingly right! So, what are Jon and Dany? Kissing cousins? As the Mother of Dragons, can Dany retake control of Viserion when they meet in battle? Considering the long dry spell that fans like me now face until the all-too-short final season, I plan to keep this episode on my DVR and re-watch it at regular intervals to keep my GoT adrenalin levels peaked. What a great season ending! Is it late 2018 yet? Absolutely overjoyed at the Arya/Sansa/Littlefinger thing - YES!!!! Something occured to me for some reason. I wonder if Dragonglass can kill Darth Glegane? Aunt/neice. So pumped they finally confirmed that! Dunno, but Clegane bowl is all but promised now! Nephew and Aunt and Jon is the rightful heir to the throne. It will be interesting to see how they handle this esp if she gets pregnant. It will be interesting to see how they handle this esp if she gets pregnant. Ya, when, I think you mean. They were a bit heavy handed foreshadowing that she’s probably not sterile after all. I’m very interested how it goes down. It will just be Bran, with apparent vested intetest in Stark family power, telling Jon and Danny the news. Nobody else can confirm it. Unless, when he finally meets Dany, he breaks the ice like he did with Sansa, heh. My other half commented that it was the first time she'd seen Kit Harrington's buttocks. I think it was a highlight for her. And what exactly was the Ice Dragon exhaling instead of fire? I really thought Little-finger had hoodwinked Sansa again. Didn't see that coming at all and then Arya...priceless!!! So much fun and a long time coming. Bye Bye Petyr!!! A hint about who might be in a spin-off? Jon, Dany and, of course, the lovelorn Jorah and Tyrion, pining away in the background. In a completely unrelated comment, I liked Jamie's suggestion as Tyrion headed for his quite possibly fatal audience with Cersei. "I suppose we should say good-bye -- one idiot to another." I could not have said it better. Although it surprised me that the colour of his fire was changed from reddish orange to blueish white, which indicate in our science much, much higher temperatures. I honestly thought the change would be from fire to ice, and maybe even using that undead wyrm to spread road around the Wall. Not melt a path through it. Where are all wizards when you need them? In a classical fantasy terms we would have needed one to get shocked at top of the wall. There was none. Not even a maister rattling his chains and quoting the books. The one wizard to speak is the Night King riding an impossible dragon. With the Wall down there is nothing nobody can do. They had a chance, while the Wall was still standing if they united their armies for one big clash. To be honest, bringing Unsullied, Dothraki, Lannisters, Northern Clans and the Night Watch all to Winterfell is a bad move, because they have no food to keep the living alive. If Sansa would have brain in her head, she would have sent a raven to deny the meet, because of the dire situation to keep them all alive. Unsullied especially are going to suffer horribly, because the poor bastards don't have winter gear. In a way, if they're ever to clash each other they should have tried to do it at the Wall or then withdraw all land and move as far to South as they can. As the Winter advances it should become much easier as with climbing ice, the seas should withdraw, maybe even connecting Iron Islands with the land bridge, just as we'd last time during the ice age. So it was only a wise move from Cercei to call in the golden cloaks to come defend King's Landing. I believe it's going to be the end place for whole series as the snow falling over the map of Westros was part of the vision we saw happening a few seasons ago. Liar. I read that line before I saw the episode and thenm I was waiting for it to happen. Jaime did the right thing. He is choosing the correct side to wage his war, because Cercei can never hold the Iron Throne if Night King chooses to march directly at the South and leave the Living suffer at the Winterfell. Given time they will all become his people. It was Cercei meet with Tyrion that I was expecting to go horribly wrong. And the only reason for him to do that was to get a taste from the royal winery for last time before they darkness falls upon the land and wrap it in cold, white blanket. To be honest, the whole meet could had been done by Tyrion and Cercei's Hand. No need to involve everyone else, and what was really surprising was Qyburn was so intrigued by the display of true dead. He could not figure out how Night King had turned rotten dead and kept individual body parts still alive, after they'd been detached from the body. If I would have been him, I would have stolen the remains and dispatched spies to the north to capture one for studies. There must be some manuscripts left that explain the whole thing and therefore give him even more power over the dead. Frankly, his work with the Undead Mountain is remarkable, as for most part Mountain acts intelligently. He even knew to step in Jamie's path when he was about to leave. Good bye old friend. I hope Arya's calmness means she's going to keep LF's face, because I'm sure it's going to be useful as not everyone know he's dead. The Faceless God would be pleased for the offering. If not then maybe we will see him wandering among the dead next season. Liar. I read that line before I saw the episode and thenm I was waiting for it to happen. Jaime did the right thing. He also did the right thing by calling Cersei's bluff, even as the Mountain unsheathed his sword. He and Sis also have that whole love history, plus their future bundle of joy. Well. Slightly confused by aerodynamics of wings with holes in but otherwise happy! It's a good episode. The biggest caveat is that they could have cut out the 2 episodes in which Jon and his merry men go on their stupid quest. Whilst dany giftwrappes a dragon to bring a solution to how the others are going to bring the wall down. 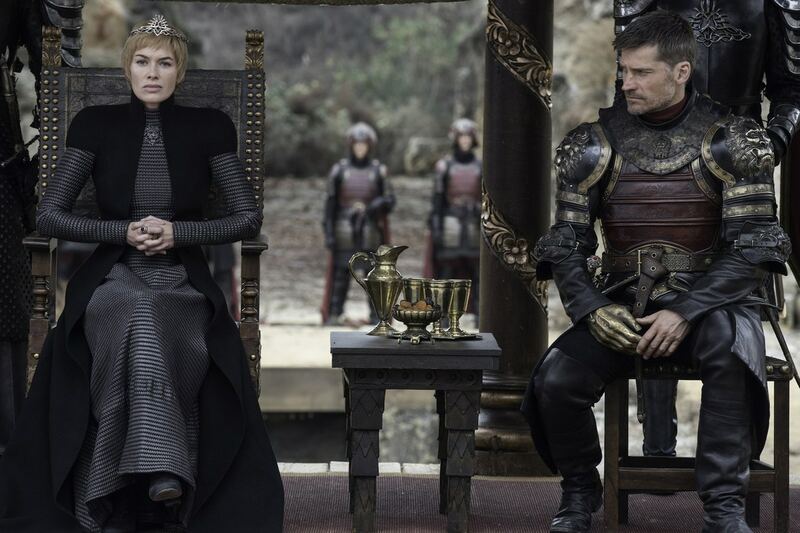 Would have preferred this meeting and episode taking place 2 episodes ago without that stupid queest and the wall being brought down by some other means. Again this episode was solid though. One thing bothered me. How many new wives want to name their firstborn after a child from the father's previous marriage, even if indirectly? Yes,I agree. 2 of Rhaegar's children being named Aegon is just stupid. I'm guessing the showrunners expect us not to remember the names of Rheagar's children with Elia. Here's hoping he goes by the name of Jahaerys in the books. Anyone else notice the actor playing Rhaegar is also the actor who played Viserys. Or did I see that wrong.Maybe just a lookalike. Not entirely sure. It looked like the same actor only a bit older from before.